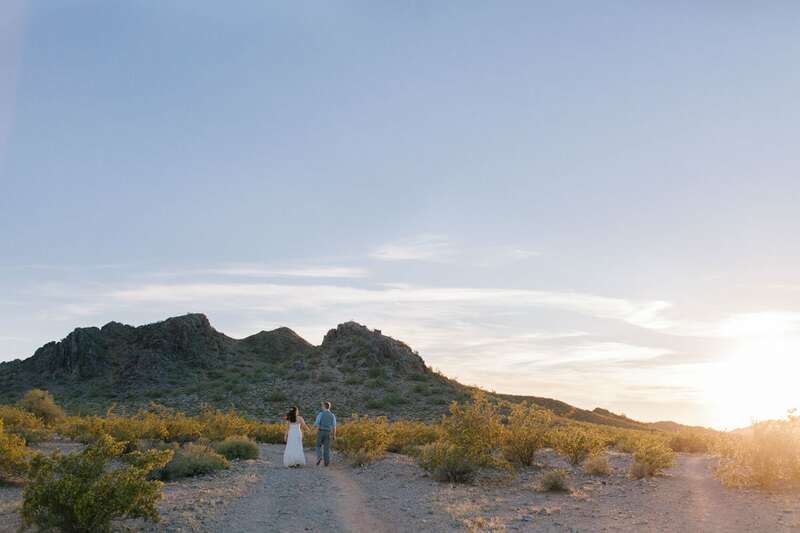 here are some beautiful locations throughout all of Arizona to elope! For a lot of people, a big wedding just isn’t their thing. Big weddings can be expensive and a lot of stress. You might rather have a small gathering with their closest friends & family, or perhaps even just your partner & you and your officiant. It can be easy to get caught up in other people’s expectations, but ultimately, it boils down to what is right for you and your partner. These days, you don’t just have to go to a courthouse. 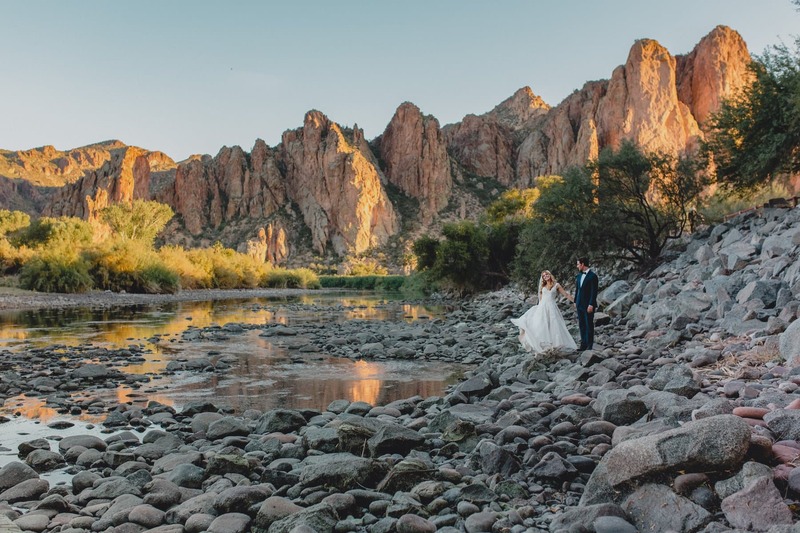 Arizona has such stunning natural landscapes to utilitize, allowing you to have a more personal, intimate ceremony reflective of you and get amazing photos as well! To elope, you’ll need an officiant, 2 witnesses besides your officiant, and a marriage license. Your officiant can be a friend who’s been ordained online, or you can hire one of the many wonderful officiants here in Arizona to perform your ceremony. Even picking a place to elope can be overwhelming however, especially in Arizona with so many beautiful natural locations. The location can have special meaning to you, like where you had your first hike, first date, where your partner proposed, or it can simply be a place you just love for no other reason than it’s beautiful. When you elope outside the courthouse, you trade ugly flourescent lighting for beautiful natural light, the ability to have your ceremony on your own time and in your own way, and do whatever the heck you want! You can make your own schedule- or not, if you’re a more go with the flow person. You aren’t limited to the courthouse’s weekday hours and schedule. Best yet, you can only have people you trust present and can fully be yourselves- you can cry if you need to, laugh, jump for joy! You guys just got married and a stranger’s not watching you! Have I convinced you yet? Phoenix and the surrounding cities- Scottsdale, Gilbert, Chandler, Tempe, Mesa, Glendale & Queen Creek have so many beautiful outdoor scenic areas to elope. Best of all, they are close! Arizona also makes a stunningly beautiful destination elopement location. The Salt River is an iconic area for natives of Phoenix. Near Mesa, it features the important Salt River which flows from Saguaro Lake along stunning mountains, desert and riparian habitats home to the Salt River wild horses. Yes, that’s right, there are wild horses that you might encounter here! They are a treat to respectfully observe from a distance. The mountains, river and trees along with the desert make for a stunning backdrop for your elopement. The Phoenix Mountain Preserve is in the heart of Phoenix, near Phoenix, Scottsdale and Paradise Valley. It’s home to some stunning mountains and desert landscapes. 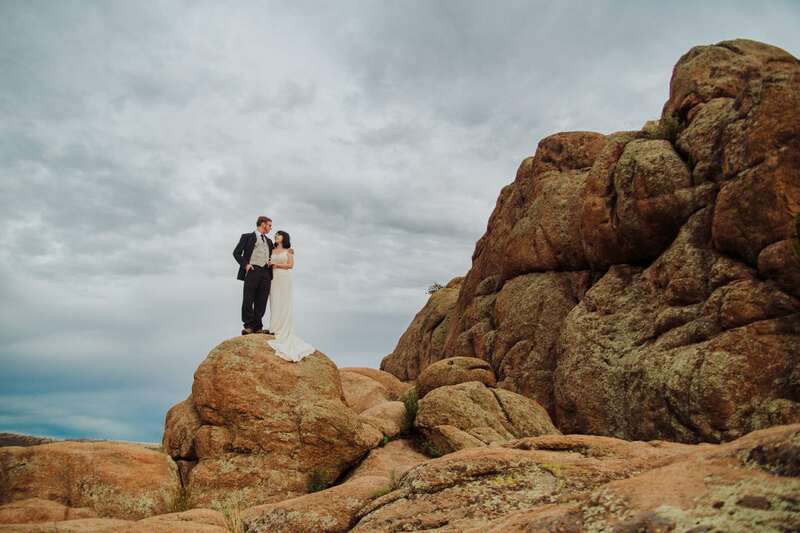 Check out this Phoenix Mountain Preserve elopement for some inspiration! We can take a hike to the top or stay at the base of the mountains. Located in Mesa, the Gilbert Riparian Preserve is a favorite spot of bird watchers and little nature escape in the middle of the city. It tends to be crowded, especially around October-November, however it’s a large property that you can work your way back into and find your own private spot. There are many small ponds and lakes which provide habitat for birds, jackrabbits and cottonwood trees. The Superstitions are an iconic backdrop of Phoenix and Mesa. The mountains get their name from the legend of the Lost Dutchman. It’s hard to beat their stunning beauty and the way they light up at sunset, making them a perfect spot to elope. There are a variety of spots around the Superstitions- hiking along Peralta Trail, hiking up near Siphon’s Draw for the adventurous and fit couple, or just picking a spot to pull over and enjoy the view at sunset. See more from Alex & Jack’s Superstition Mountain anniversary session near the adorable Elvis Church & Superstition Mountain Museum! Throughout the year, weather conditions can vary greatly. One of the big benefits of eloping in the Phoenix area is the weather is fantastic October-April when most areas in the rest of the US are cold and snowy. In the Phoenix area, you can expect temperatures between 50 degrees to 75 degrees on average during this time. Absolutely perfect in my opinion, especially if you are traveling from a state that gets a lot of snow, such as the eastern US or Midwest. Phoenix does not get snow, even in mountainous regions such as the Salt River or Superstition Mountains. At night, it can get a bit chilly though- often between 30-50 degrees, but usually between 40-50. In general, there isn’t a lot of rain during this period of time either, except February. 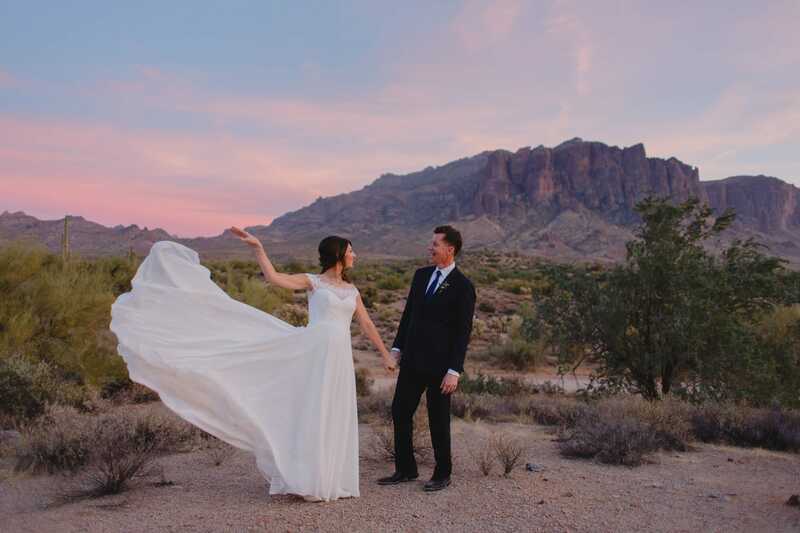 Spring is a fabulous time in Arizona to elope, though it also coincides with a very busy wedding and portrait season, so weekend dates are in very high demand. Temperatures can range widely from the 60’s to the upper 80’s during March & April, and towards the end of April through May can reach up to 100 degrees. By the end of May, summer is here and with it are our notoriously hot temperatures. I recommend getting your elopement in before then if you can’t handle the high temperatures! Rain can happen in March but with the Phoenix area being a desert, rain is generally not a big problem. Desert plants are blooming during this time which is great for photos but may present a problem for allergy sufferers. My favorite blooming plants are the palo verde trees which typically bloom between April & May with green barked trees covered in bright yellow blooms. Wildflower season is short and rain dependent but typically happens between March & April as well! Summer in Phoenix is not a pleasant time to elope outdoors. Temperatures range from 100-120 during this time and most Phoenicians go into hibernation mode, only going outside when absolutely necessary or at night when the temperatures drop down to a more tolerable 80-90 degrees. Because of the high risk of heat exhaustion and general unbearable-ness, I don’t recommend eloping in the Phoenix area during summer. Even at sunrise, which would mean a 5AM start time, temperatures are usually 80-90 degrees, climbing to 100+ by 8 or 9AM. If you have your heart set on a summer elopement, I recommend indoor, air conditioned venues, or a northern Arizona location where it’s 20 degrees cooler because of the higher elevations. Additionally, June- September is “monsoon season”- a time of increased and somewhat unpredictable seasonal rains, so there is a much higher chance of rain and potentially dangerous storms and dust storms. Fall in Phoenix isn’t what a lot of people think of when they think of fall. It’s still usually 80-100 degrees and because of the desert climate, we have no changing leaves to speak of. But there is a gradual break in the miserable temperatures of summer and night time temperatures start to fall, so October begins the busy season of weddings and family portraits which really amps up in November before Thanksgiving. I love traveling to northern Arizona for it’s cooler climate, beautiful pine trees and mountains and adorable cities and towns with history & character. Northern Arizona is definitely the place to get married in the summer or winter if you really want a winter wedding with snow! 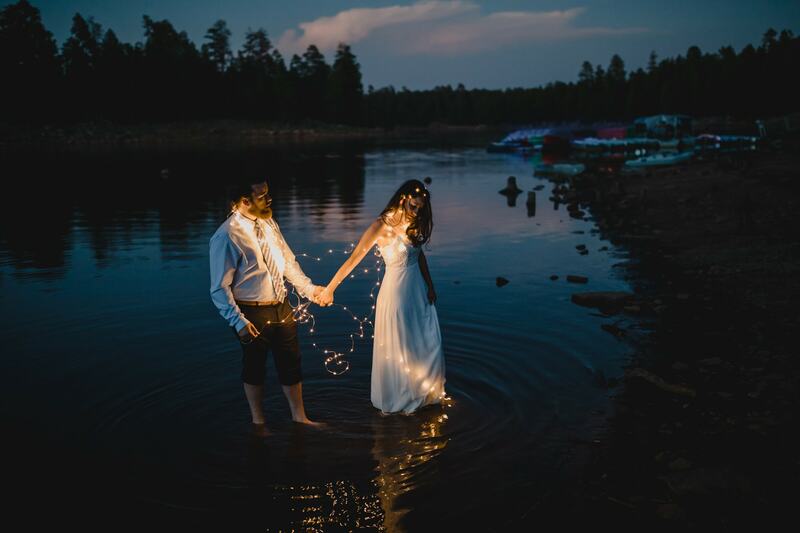 There are several gorgeous spots in Payson that would be perfect for eloping- the Mogollon Rim is a stunning spot, or Tonto Natural Bridge or any of the numerous hiking trails in the area. It’s also a convenient place to escape the summer heat- only 1.5 hours drive away from the valley and usually at least 15 degrees cooler in the summer. Monsoons frequent the are though in the summer from July-early September, so keep that in mind! 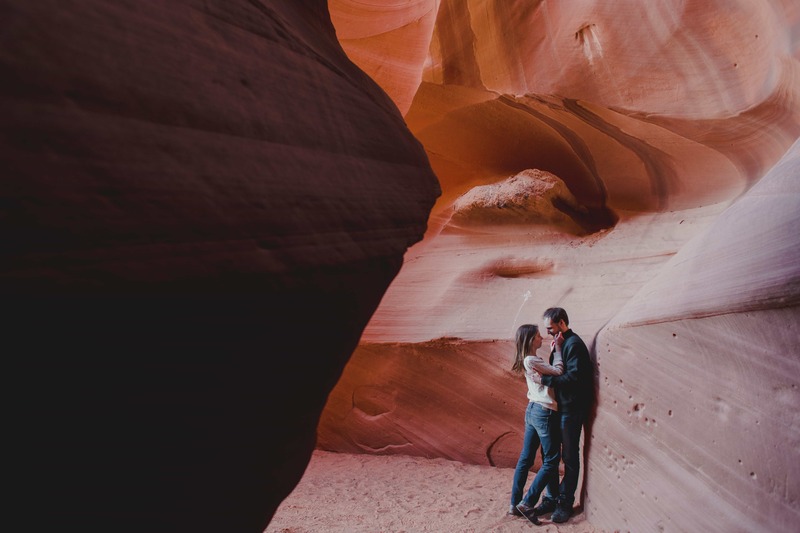 Of course Sedona is a popular choice of location to elope- for good reason too, it’s one of the most stunning places Arizona has to offer, if you don’t mind tourists. 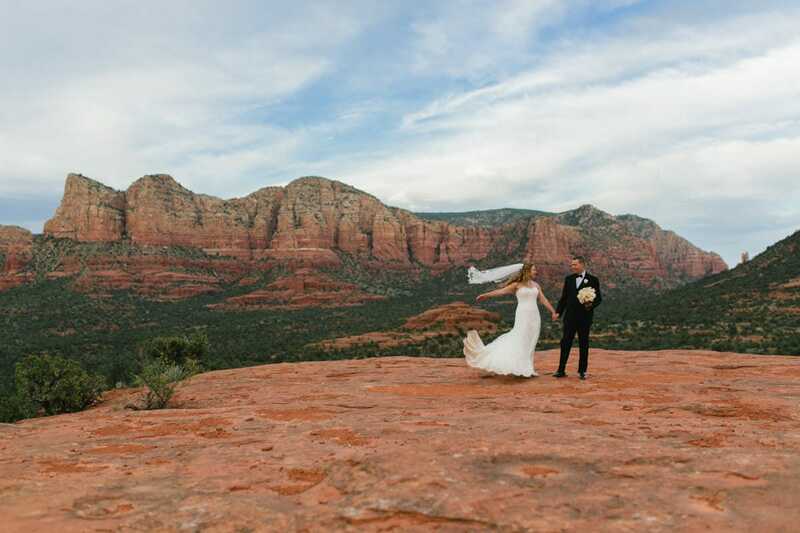 Weekdays are often much less busy than weekends if you have some iconic Sedona hikes you’d like to have your ceremony on. See more from Krista & Matt’s sweet Sedona elopement & Laura & Marcus’s Sedona elopement! 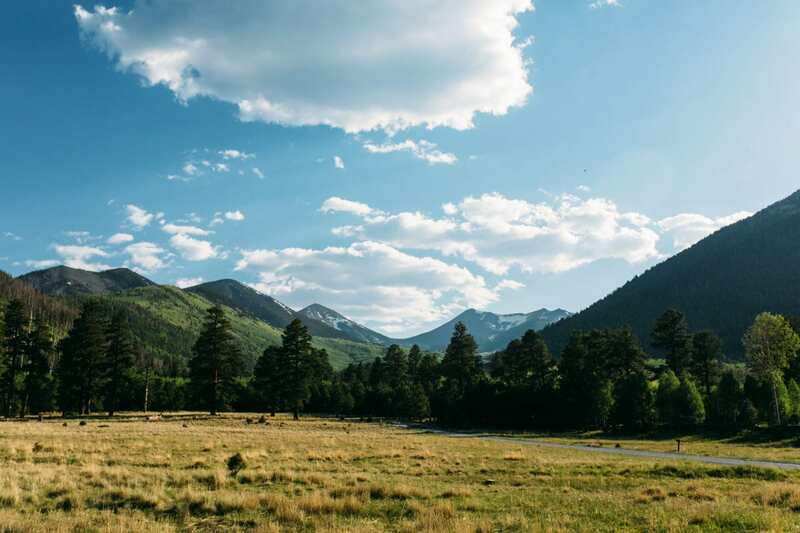 If you’d like to elope during the height of the Arizona summer, or you love pine trees and mountains, you should definitely consider Flagstaff. Humphrey’s Peak is the highest point in Arizona and has forests of pines and aspen trees. Lockett Meadow is a popular spot, though it requires four wheel drive to get to. 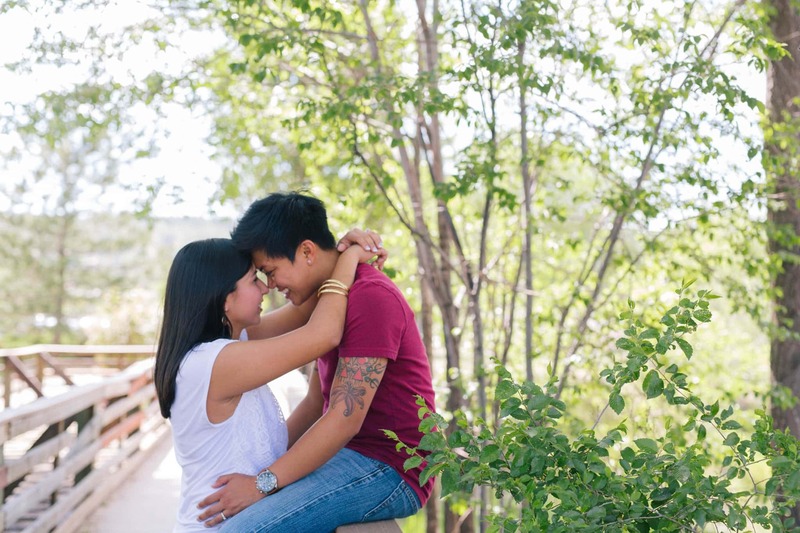 See Leonor & Katryna’s Flagstaff engagement session to see more from their session! There are many other areas around Flagstaff that would be lovely to elope. Check out all the local hiking trails in the area and you could hit up one of Flagstaff’s adorable pubs & bars or coffeeshops for a post ceremony celebratory drink afterwards! Prescott is an adorable town about 2-2.5 hours away from the Phoenix metro area. Whiskey Row is a popular tourist attraction, full of cute bars and restuarants and historic hotels. My favorite spot in Prescott is Watson Lake, not far from town, full of granite boulders and a beautiful lake that would make a perfect ceremony backdrop. You can head to town for a post celebratory drink at any of the bars or restuarants! Of course, the iconic Antelope Canyon & Horseshoe Bend is a super popular location. It’s quite a journey but worth it- 5 hours from the Phoenix area and requires a booking with a local Navajo guide & a wedding permit which is purchased through the Navajo Tribal Park. View more information here. The tours operate year round, however the famous light beams, more common and more popular in the Upper Antelope Canyon, peak between March 20 to Oct 7. Lower Antelope Canyon requires hiking, is less crowded but also narrower, and has less light beams and light is better in the early to late morning. Horseshoe Bend is nearby and a great stop towards sunset or for your ceremony, though it is also often very crowded. Throughout the year, weather conditions can vary greatly especially in northern Arizona. Northern Arizona follows more traditional season compared with the rest of the country, compared to Phoenix which doesn’t have much of a fall or winter. Flagstaff & the Grand Canyon are generally the coldest areas because both are at the highest elevation. The city of Flagstaff is at an elevation of around 7000 feet compared with 1000-2000 feet in the Phoenix area. In Flagstaff, you will see snow during this time, but other areas it is not as common to see regular snowfall except in mountainous areas. Temperatures average between 50-70 in Sedona during these months, Flagstaff usually sees 30-50 degrees with some periods of time of colder weather and Prescott & Payson between 40-60 degrees. Payson is warmer on average than the Mogollon Rim which is 45 minutes northeast of town and at a much higher elevation and gets some snowfall throughout these months. Payson has a good number of pine tree forests which are evergreen but everywhere else will have mostly drab vegetation during these times. There are ski resorts in Flagstaff and the Show Low area. March begins the warm up period for these areas of Arizona. Snow will melt, giving water to vegetation but it takes until mid to late March on average for most areas to really start greening up except for evergreen trees. Temperatures vary widely during this time with the change of season but generally are around 50-80 in most areas. Summer in northern Arizona is much more tolerable than in the more southernly regions of the state and most Phoenicians escape the summer heat by heading up to northern Arizona to camp, hike and enjoy the cooler temperatures. Temperatures average between 60-90 degrees in most areas during summer. Sedona is the warmest of the regions, usually only averaging 10 degrees cooler than the Phoenix area. A lot of people think Sedona is much cooler, but I find that it’s usually not significantly cooler during the summer months. Monsoon season, a seasonal shift in weather patterns bringing in a higher chance of often unpredictable rains and storms, happens during this period. In northern Arizona particularly around Flagstaff and the Mogollon Rim, these monsoon storms are pretty unpredictable, popping up & developing quickly in the afternoons. Flash flooding is a risk during this period of time, so if you are planning on eloping during this time, pay close attention to the weather & radar on the day and have a rain plan. This is a lovely time of year for Northern Arizona and most people go to northern Arizona to search for fall color which is elusive in the Phoenix area. The best areas for changing leaves are Flagstaff because of it’s high elevation and some small patches near Payson, Oak Creek Canyon in Sedona and eastern Arizona around the White Mountains near Show Low, Greer and Pine Top etc. Temperatures vary widely but usually average between 40-70 degrees depending on the area and month. Mt. Lemmon is a beautiful mountain near Tuscon and is 9000 ft tall. The summit is 20 degrees cooler than the base so it’s a nice way to escape the heat. The Catalina Highway, also known as Sky Island Scenic Byway, runs up the side of the mountain and is a curvy, scenic highway for drivers & cyclists and runs through the lowland desert climate to alpine forests. Mt. Lemmon also has an observatory on it’s peak and a ski run. 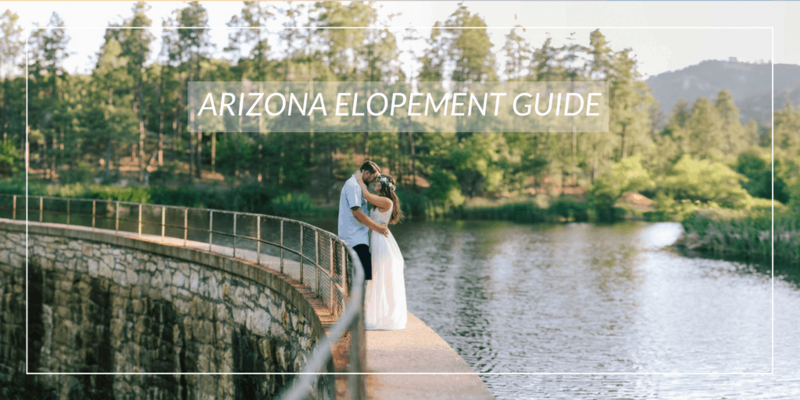 Want a FREE guide to planning your Arizona elopement? Pop your email in here and you’ll get the guide almost instantly!